Simca was a French automaker, founded in November 1934 by Fiat and directed from July 1935 to May 1963 by Italian Henri Théodore Pigozzi. Simca was affiliated with Fiat and, after Simca bought Ford's French activities, became increasingly controlled by the Chrysler Group. In 1970, Simca became a subsidiary and brand of Chrysler Europe, ending its period as an independent company. Simca disappeared in 1978, when Chrysler divested its European operations to another French automaker, PSA Peugeot Citroën. PSA replaced the Simca brand with Talbot after a short period when some models were badged as Simca-Talbots. Chrysler Corporation had never had much success outside North America, contrasting with Ford's worldwide reach and General Motors' success with Opel, Vauxhall, Holden and Bedford. Chrysler first established an interest in the French-based Simca in 1958, buying 15% of the Simca stocks from Ford. In 1963 Chrysler increased their stake to a controlling 63%   by purchasing further stock from Fiat. Opel is a German automobile manufacturer, a subsidiary of French automaker Groupe PSA since August 2017. From 1929 until 2017, Opel was owned by American automaker General Motors. Opel vehicles are sold in the United Kingdom under the Vauxhall brand and in Australasia under the Holden brand. Vauxhall Motors Limited is a British car brand, which is a fully owned subsidiary of German car manufacturer Opel, which in turn is owned by Groupe PSA of France. Vauxhall's vehicle lineup is identical to that of its parent, Opel, but the Vauxhall brand is exclusively used in the United Kingdom and Isle of Man. Vauxhall is one of the oldest established vehicle manufacturers and distribution companies in the United Kingdom. Its headquarters are in Park Town, Luton, Bedfordshire, England. Chrysler acquired a 35% share of the Spanish Barreiros in 1963,  and it became part of Chrysler Europe in 1969. Leyland Motors Limited was a British vehicle manufacturer of lorries, buses and trolleybuses. The company diversified into car manufacturing with its acquisitions of Triumph and Rover in 1960 and 1967, respectively. It gave its name to the British Leyland Motor Corporation, formed when it merged with British Motor Holdings in 1968, to become British Leyland after being nationalised. British Leyland later changed its name to simply BL, then in 1986 to Rover Group. Dodge is an American brand of automobile manufactured by FCA US LLC, based in Auburn Hills, Michigan. Dodge vehicles currently include performance cars, though for much of its existence Dodge was Chrysler's mid-priced brand above Plymouth. Karrier was a British marque of motorised municipal appliances and light commercial vehicles and trolley buses manufactured at Karrier Works, Huddersfield, West Yorkshire, by Clayton and Co., Huddersfield, Limited. They began making Karrier motor vehicles in 1908 in Queen Street South, Huddersfield. In 1920, H.F. Clayton sold Clayton and Co's Huddersfield business into public listed company Karrier Motors while keeping their Penistone operation separate and mechanical and electrical engineers Clayton & Co Penistone remains active in 2018. 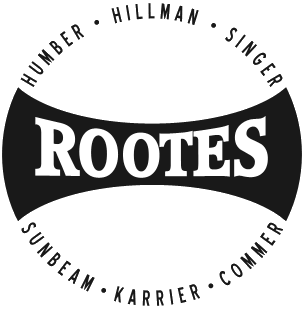 Rootes Arrow was the manufacturer's name for a range of cars produced under several badge-engineered marques by the Rootes Group from 1966 to 1979. It is amongst the last Rootes designs, developed with no influence from future owner Chrysler. The range is almost always referred to by the name of the most prolific model, the Hillman Hunter. The Hillman Avenger is a rear-wheel drive small family car originally manufactured by the former Rootes division of Chrysler Europe from 1970–1978, badged from 1976 onward as the Chrysler Avenger. 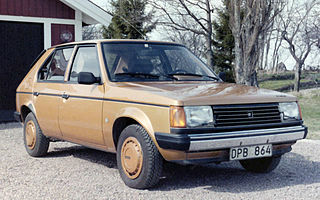 Between 1979 and 1981 it was manufactured by PSA Peugeot Citroën and badged as the Talbot Avenger. The Avenger was marketed in North America as the Plymouth Cricket. The Talbot Tagora is an executive car developed by Chrysler Europe and produced by Peugeot Société Anonyme (PSA). The Tagora was marketed under the Talbot marque after PSA took over Chrysler's European operations in 1979. PSA presented the first production vehicle in 1980 and launched it commercially in 1981. The Tagora fell short of sales expectations, described as a "showroom flop" just a year after its launch, and PSA cancelled the model two years later. Fewer than 20,000 Tagora models were built, all of them at the former Simca factory in Poissy, near Paris, France. Sunbeam-Talbot Limited was a British motor manufacturing business. It built upmarket sports-saloon versions of Rootes Group cars from 1935 to 1954. As Clément-Talbot Limited it had made Talbot cars since 1902. ↑ "Chrysler buys French auto firm". St Petersburgh Times. 1 February 1964. p. 8. Retrieved 8 February 2014. ↑ "Project Car Hell, Chrysler Captives Edition: Simca 1204, Dodge Colt, or Plymouth Cricket?". Autoweek. 31 May 2013. Retrieved 8 February 2014. ↑ "Chrysler buys one-third of Spanish Auto Builder". St Petersburgh Time. 2 October 1963. p. 5-C. Retrieved 8 February 2014. ↑ Hyde, Charles (2003). Riding the Roller Coaster: A History of the Chrysler Corporation. Wayne State University Press. p. 199. ISBN 9780814330913. ↑ "Hillman Imp: The car that drove Linwood to disaster". BBC History. 1 May 2013. Retrieved 8 February 2014. ↑ "Development of the Chrysler - Talbot - Simca Horizon". Rootes-chrysler.co.uk. Retrieved 2011-11-28.